Bound Angels Dog Rescue is dedicated to bringing attention to the shelter crisis and implementing proven solutions. Bound Angels Dog Rescue provides a unique service to shelters, humane societies and rescue organizations that helps save the lives of countless shelter pets. We have proven logical solutions and life-saving tools most of which are available free of charge both online as well as in our hosted training workshops. These programs range from online training, books, educational and dissemination campaigns, as well as hands-on canine behavior training and behavior assessments. All of our programs have been tested and proven to be very successful in large city shelter systems as well as small humane societies. Robert Cabral – Founder / Executive Director Bound Angels from Bound Angels on Vimeo. 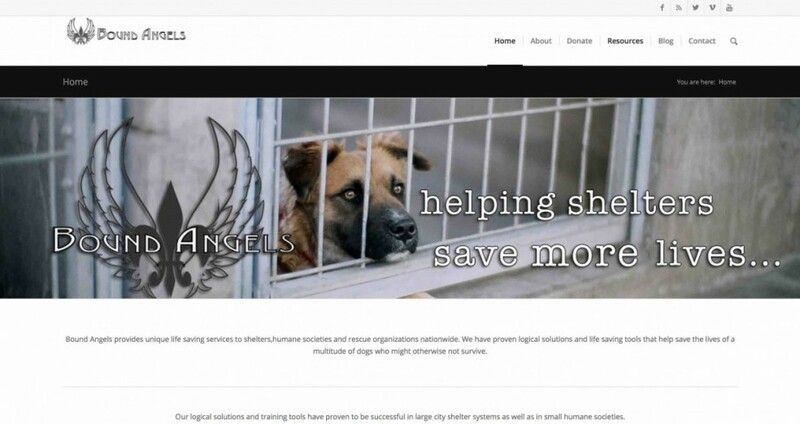 Bound Angels Dog Rescue was founded by Robert Cabral with one goal in mind – real solutions. The programs implemented by Bound Angels Dog Rescue have a proven 100% success rate in saving lives and changing the status quo of dogs that would otherwise face destruction. Our edgy — and sometimes — controversial approach speaks for the animals who do not have a voice of their own. Working hand in hand with shelter employees, management, volunteers and rescue organizations gives us a unique insight into the problems and helps us determine solutions through constructive implementation. Bound Angeles provides hands-on guidance in marketing shelter adoption programs as well as canine behavior assessments and Rescue. Most of these programs are provided free of charge to animal rescue organizations and shelters nationwide. This program has proven a 100% success rate getting dogs and cats adopted from municipal shelters through creative YouTube animal music-videos. Visit our YouTube channel by clicking here and see some of the animals that are now living happy lives as a result of these videos. This revolutionary approach to marketing shelter pets started at one Los Angeles city shelter and soon spread to other Los Angeles city shelters and beyond. The catchy videos marketing these pets can now be seen on Facebook and YouTube among other viral outlets. Countless shelters and rescues use this approach nationwide and beyond and are seeing the phenomenal results. Shelter Rescue is a two to three day intensive workshop provided by Bound Angels Dog Rescue to municipal shelters and humane societies that teaches their employees and volunteers about intensive canine behavioral skills. “Temperament testing redefined”, handling animals with issues – -including fear, dominance, aggression, and more — are all included in this hands-on workshop specifically tailored for shelter employees and volunteers. There is no other local or national organization offering workshops of this type to shelters. The classes include a lecture, Q&A, and an interactive demonstration. The goal of this program is to help shelter workers and employees better understand canine behavior and to help solve problems before they arise and solve them quickly if they do arise or are present. This program has been shown to increase employee and volunteer morale while lowering the risk of liability arising from careless mistakes. To schedule a Shelter Rescue program at your facility, please contact us by clicking on the contact link above. There are countless proven benefits to dogs interacting in groups and getting out of their kennels. These include more vibrant health, better immunity, lower stress, increased sociability and increasing their chances of adoption. These playgroups are fun for everyone involved, but there is a risk of injury if they are not structured correctly. Understanding canine behavior, pack structure, interaction, hierarchy and body language are a must for anyone implementing these playgroups. Robert teaches his system in a 2 day workshop that includes intense lecture, theory and hands on Rescue in playgroups. Selling Used Dogs is our top rated book and it is available as a free download to all rescue workers, shelters and humane organizations. Selling Used Dogs teaches life saving skills including marketing, rehabilitation, and social networking. All of the programs in the Selling Used Dogs book have been tested and proven by Bound Angels Dog Rescue in large metropolitan shelters as well as in smaller rural shelters. Selling Used Dogs is also available in paperback through many outlets including Barnes & Noble, Lulu.com and Amazon.com. Desperate Dogs Determined Measures is the long awaited follow-up book by Robert Cabral. The demand for Robert’s workshops has grown to such an extent that he’s not able to meet all of the requests. In an effort to help as many dogs (and people) as possible, he has put his system of canine evaluation, interaction and rehabilitation into this book which has been referred to as “A Bible for shelter workers.” The book, which contains over 200 pages filled with life-saving skills and techniques, is available through book outlets including Barnes & Noble, Lulu.com and Amazon.com. Over the past several years Bound Angels Dog Rescue has spearheaded a new approach toward marketing dogs doomed in shelters, fought court battles for dogs sentenced to death, created educational programs for shelter workers and volunteers and created media campaigns to bring attention to our shelter crisis. Each year millions of shelter animals are murdered due to broken shelter systems. It’s ironic that they are called “shelters,” since they are tragically only holding areas for dogs to be killed. Dogs that were once family pets are now being imprisoned for a crime they did not commit. These dogs are deprived of human interaction and their greatest hope is to be adopted and that rate is currently only 45%. Unfortunately, those that don’t make it face an inevitable death. Our mission at Bound Angels Dog Rescue is to bring animal suffering to the forefront and encourage people to care for their animals, adopt shelter animals, and spay and neuter their pets. Bound Angels Dog Rescue strives to change the public policy on “kill shelters,” expose animals’ suffering, and fight for the rights of those that cannot fight for themselves. All of our work is made possible through the support of friends like you. Please consider donating to us today because the animals we save depend on your generosity and caring. To get a better understanding of Bound Angels Dog Rescue and what we’re all about, please visit our YouTube Channel & check out our campaigns.